Having a purpose provides the necessary foundation for great storytelling – a strong seed to grow an effective content marketing program. Yet, many nonprofits lack a couple things most B2B and B2C marketers do have to make content marketing a success: staffing and budget. 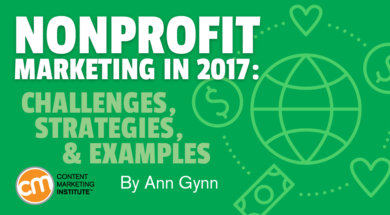 But even with these challenges, nonprofit content marketing success – even on a smaller scale – is possible. By taking just a few deliberate steps, nonprofits can create and nurture a content marketing plan that will live vibrantly for years, furthering the nonprofit’s purpose and working to grow a stronger community. According to Russell, the combination of structured purpose plus meaningful stories enables nonprofit marketers to create content that matters to people’s lives, which might be educational and inspirational, and is definitely shareable. While nonprofits are primed for content marketing, not quite four-fifths (79%) say their organization uses it. But less than one-fourth (24%) of those marketers describe their organization’s overall approach to content marketing as “extremely” or “very” successful, according to CMI’s annual content marketing survey conducted in summer 2016. It’s easy to understand why nonprofits don’t find content marketing effective. As Russell explains, the challenges for nonprofits are great as well – financial, human resources, and governance problems must be overcome to leverage the true value of content marketing. In my own work with nonprofits, I have heard and seen those challenges play out. To solve a staffing challenge, a nonprofit board member pushes for the organization to launch an Instagram account and says the nonprofit should bring in a high-school-age intern to help because teens are on social media all the time. To find a desire to address governance issues, the nonprofit often must confront a problem first. For example, that teen intern publishes a blog post using language that doesn’t match the nonprofit’s voice, or worse, doesn’t pass muster with the nonprofit’s board. Do any of those scenarios sound familiar? Those making the recommendations in these nonprofits usually are well-meaning, but they don’t grasp the effective meaning of content marketing or appreciate why a comprehensive program, rather than one-off activities, will make better use of human and financial resources. You can take on those obstacles by focusing on these three things – documenting your strategy, re-evaluating your budget, and staffing your team. Here are some ideas on how to do that. So instead of waiting for the financial wherewithal, figure out how to operate a manageable content marketing program based on the resources you do have. That starts, Russell says, with a written content marketing strategy. Having a documented plan will help you get on the same page with your board and staff – laying the groundwork for your content marketing program based on the resources available and setting up an evaluation process with measurable goals that everybody agrees to. In his firm’s experience, nonprofits investing in a content marketing strategy document also are able to raise significant money to fund their organization’s initiatives. A documented marketing strategy can sound like a Herculean task when you have 10 other things to get done in a day, and marketing is only part of your job. But taking even a few hours to create a strategy will pay dividends – preventing wasted efforts (financial and staffing). HOW TO DO IT: I often share with nonprofits this post from George Stenitzer that spells out how to craft a one-page content marketing strategy. He takes you through a simple step-by-step process, and in the end you’ll have written down your strategy. You can do this with your board or its marketing committee. Share the draft with all, ask for input (set a deadline), and then implement it. Want to boil down your strategy to make it even simpler? Follow Russell’s model on a strategic content statement. TIP: A one-page content marketing strategy is easy to understand and more likely to be used by volunteers and staff implementing it. TIP: If your organization’s board has a marketing committee, get those members involved in the process early on, and ultimately have its chair present the recommended strategy to the full board for review and/or approval. Or if there isn’t a separate marketing committee, invite a couple board members into the process from the outset. That buy-in of your governing team is essential. Then, as suggestions arise (as they always do) on how to handle your organization’s content marketing, you can reference the board-approved strategy and say you’ll note their ideas for the next strategy review. According to the most recent CMI research, marketers report that only 20 cents of every marketing dollar goes to content marketing. “Nonprofits have to make budgeting for content a priority when creating their budgets,” Russell says. “The reality of the world we live in today is that content for advancing nonprofit goals is as essential as oxygen is to breathing. It can’t be an afterthought or a task relegated to the when-we-can-afford-it shelf. TIP: Some nonprofits are having funding success by selling brand sponsorship of their content, according to Russell. HOW TO DO IT: Stop taking an ad-hoc approach as a specific content need or budget issue arises. Investigate how every organizational dollar is being spent against your overall content marketing strategy. To find more financial resources for content marketing (or to show how your content marketing strategy can save the organization money), identify possible efficiencies and collaborative improvements. Hint: They may not all be related to marketing. For example, the marketing team cuts its printed newsletter budget in favor of a much less expensive e-newsletter program. It subscribes to a cloud-based newsletter program, which hosts the email database, assists in the creation of e-newsletters, and emails the content to the database. The savings are significant and everybody is thrilled. But what if that team investigated the nonprofit’s budget and found that the development team has its own database service to communicate with and track donors, and the admin team has an Excel document with contacts for board members and the annual holiday card list. With that knowledge, the marketing team can work to find a singular solution to prevent redundancies, centralize communication, reduce expenses, and improve overall effectiveness. TIP: Start building a bridge with your fundraising or development team through this budget evaluation process. Too many nonprofits conduct marketing and development separately when the two should go hand in hand. Three-fourths of marketers are in the first steps, young, or adolescent phase of content marketing, according to CMI research. “The reality is that the nonprofit sector’s workforce is very inexperienced when it comes to true content marketing,” Russell says. Nonprofit board members also tend to lack sufficient depth and breadth of content marketing experience to be a significant value to the organization’s staff in the successful implementation of the content marketing program. HOW TO DO IT: Russell advises nonprofits to work with a full-service content marketing agency to maximize their efforts. Unlike someone who specializes in website development and another who is focused on email marketing, he says, an agency deeply understands how to integrate all aspects of marketing, advertising, and public relations. Though an agency may seem more expensive in the beginning, it could cost less in the end because it’s familiar with every marketing dollar being spent. That’s why – single agency or not – every nonprofit still needs an internal champion, a go-to, accountability person for its content marketing program. Even if this person isn’t the expert, she or he should understand (or learn) the basics, the nonprofit’s purpose and strategy, and can stay on top of what is being done by the agency or internal staff. Russell offers these three examples of organizations taking typical nonprofit tactics – annual reports, consumer education, and public awareness that they already do – and transforming them into modern-day content marketing successes. Bread for the World’s Hunger Reports: An annual research report, it now is the basis of a video series, infographics, blog posts, created and distributed based upon an editorial calendar. The goal is to get the Hunger Report known by a greater range of organizations with influencer development playing an important role in the initiative. For example, U.S. environmentalist and author Bill McKibben participated in the video series. As he shares his role in the video, the Hunger Report’s audience could expand to Bill’s 250,000-plus Twitter followers and the 330,000 followers of his organization, 350.org. 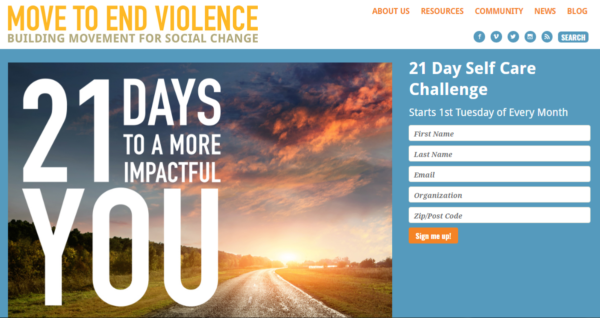 Move to End Violence’s 21 Day Self-Care Challenge: FusionSpark Media’s client uses marketing automation to operate this ongoing content initiative, which sends one self-care tip a day for 21 days to subscribers. This project has seen the email database grow from 400 to 11,000 subscribers in a little bit more than a year. SaveTheSource.org: This is a public awareness and public education campaign of the Pinelands Preservation Alliance. 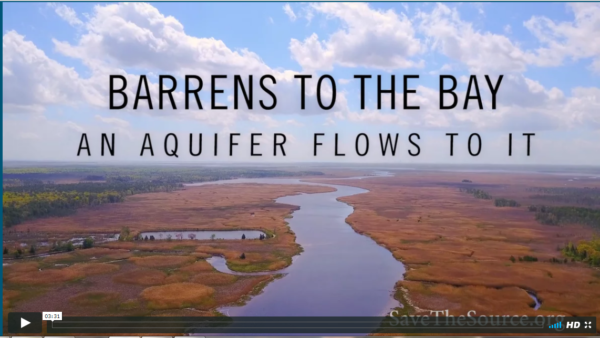 A core content feature of the initiative is a yearlong series of videos explaining New Jersey’s freshwater aquifer and the need to protect it. 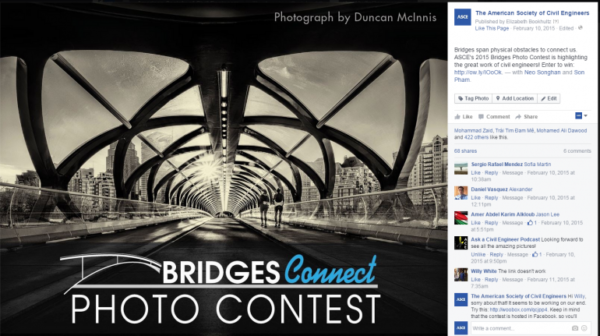 American Society of Civil Engineers Bridges Photo Contest: ASCE took a social and print content approach in its annual photo competition around images of bridges as part of its ongoing content marketing to promote the civil engineering profession around the world. It used images from the social media campaign to put together its annual calendar of bridges. According to Connectivity by CQ Roll Call, one year of its special Facebook app elicited 900 images from 50 countries, a Facebook reach (including highlighting the winners) of 197,000 people, and nearly 15,000 print calendars sold. 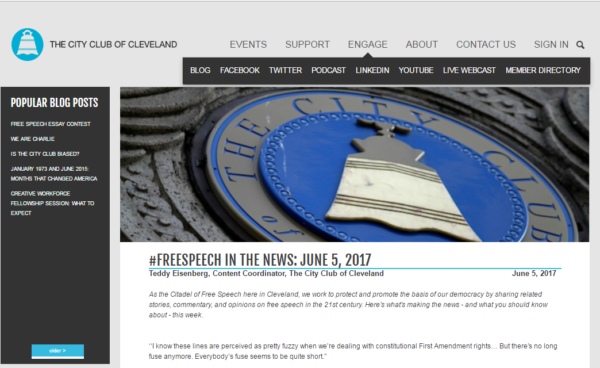 The City Club of Cleveland Free Speech in the News: The 105-year-old nonprofit is the longest continually operating free speech forum in the United States. It has long been known for its weekly public forums – including a 30-minute unscripted public Q&A – with regional, U.S., or global leaders from the public, corporate, or nonprofit sectors. More recently, it’s expanded its reach by, among other things, curating content around its mission for a weekly blog post: #FreeSpeech in the News. Using the hashtag also enables the organization to tie itself into the topical conversation on social media. As a nonprofit marketer, you are well-positioned to tell stories that have impact. Just make sure you don’t let obstacles get in your way. By creating a comprehensive content marketing strategy, realigning your marketing dollars, and ensuring that you have the necessary talent to implement your strategy, your great stories will go further, attracting and motivating your audiences to do more even if your budget is small. Ready to carve out five hours to focus on nonprofit content marketing with FusionSpark Media’s Russell Sparkman? Register for the Content Marketing World 2017 Non-Profit Lab on Sept. 8. Use code BLOG100 to save $100 on registration.